Storing Key/Value Pairs Store, expire and fetch values. 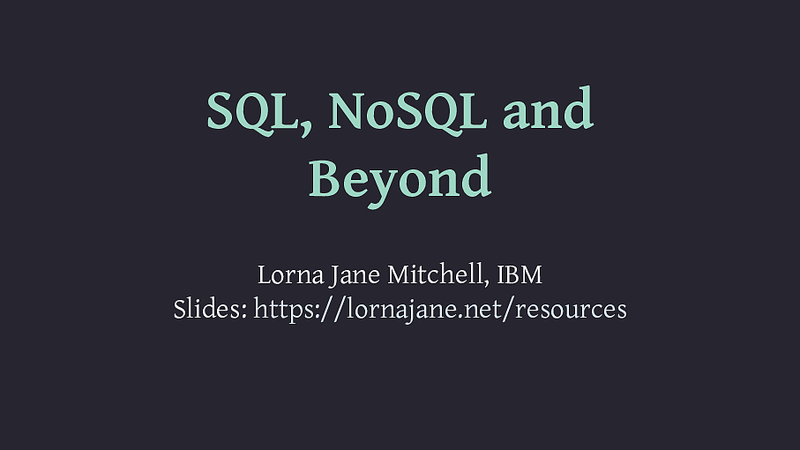 View SQL, NoSQL and Beyond on Notist. We’ve been happy relying on MySQL for years, but have you ever wondered what other options are out there? This session will give you a tour of your options and some advice on when you might want to pick an alternative (and when you might not!). We’ll start with PostgreSQL, a very familiar paradigm but with some very valuable features not available in MySQL. We’ll take a look at Redis, and cover when a key-value store makes a valuable addition to an application. We’ll also visit CouchDB and discuss what NoSQL is, why CouchDB is excellent, and where it could fit into your stack. This session is intended for developers with MySQL experience who are looking to scale up their applications beyond just-another-website and are up for taking on some new technology to become even more awesome than they are already.